Maintenance of authentic land records is key to efficient management of land. Manual system of record keeping has not proved adequate and been marked by opacity, untimely updation or non-updation, corruption and harassment to the people. 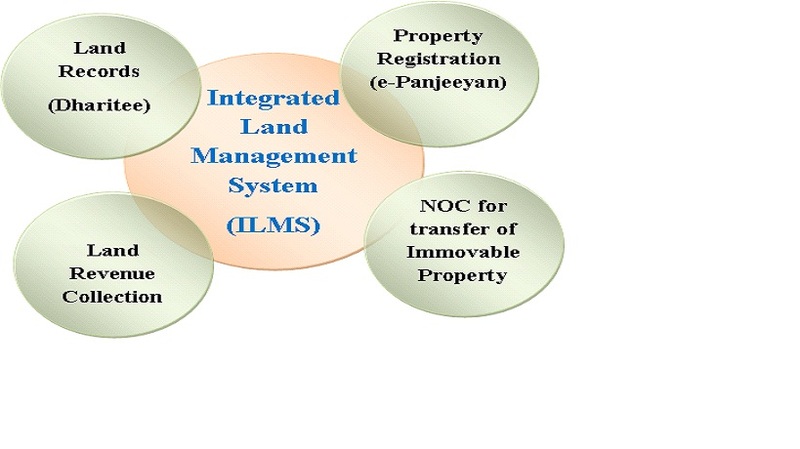 State Government took the decision to launch web-based Integrated Land records management System as an answer to all these problems by ensuring interconnectivity among the Revenue Circle, Sub-registrar, Deputy Commissioners' offices and the Directorate of land Records. 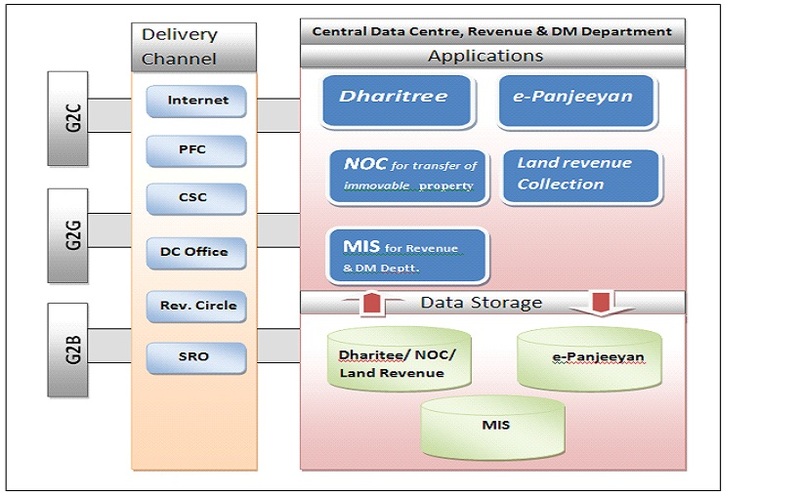 The Integrated land Records System has four components – online system of issuing NOC for the transfer of immovable property, as required under section 21A of the Registration Act, Dharitry - online system for updation of land records, e-Panjiyan – online system for registration of property, and online system for land revenue collection. All these four systems can talk to one another and ensure optimum efficiency, transparency and accountability in the revenue administration. 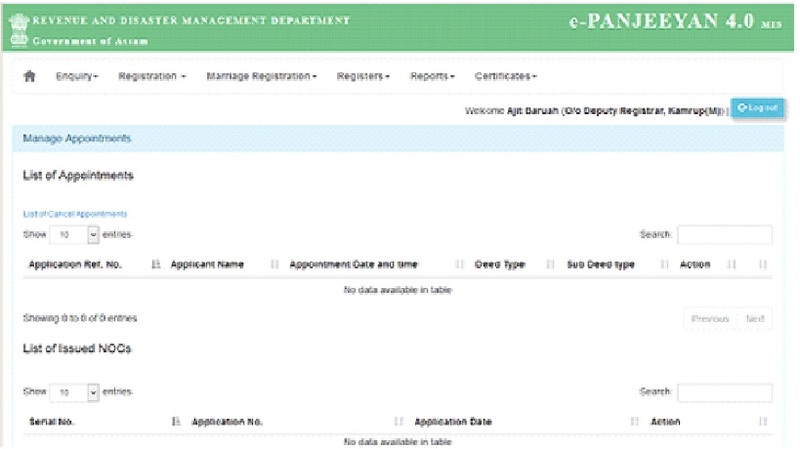 The Integrated Land Records Management System ensures that all the processes for the transfer and registration of land and updation of land records, like, Mutation, partition, Conversion, and Reclassification, and land revenue collection are handled online and people will have access to the land records online. Endeavour is being made to equip it with the facility of online payment though the payment gateway provided by State bank of India and next step is to link it up with the systems of the institutions like Banks, Cooperative Societies, Urban Local Bodies etc, so that the delivery of services which require verification of land records get fast and hassle-free. One important aspect of land records management is the availability of maps that mirror ground realities. Significant strides have been made in this area by digitising about 26000 village maps with the help of ASTEC and integrating them with Dharitry through the software called: Bhu-naksha. There are still about 2500 villages which are either unsurveyed or map-sheets for which are not available, but Bhu-naksha is proving to be a great tool in the hands of land Records staff for updating the land records and correcting the instances of mismatch between the textual data and maps. An effective system of record-keeping also requires proper maintenance of old records. State Government has taken up construction of 129 Modern Record Rooms in the Deputy Commissioner Offices and Revenue Circles. The MRRs have computerized Document management System which not only facilitates safe upkeep, but also an easy retrieval of the records. Once all of them are completed, it will be ensured that they become part of the integrated land Records management System. For all these institutional and e-governance initiatives to wok satisfactorily, it is necessary that there are instrumentalities available to monitor the functioning of those responsible for making them work. State Government has taken two major initiatives to enforce accountability. Management Information System (MIS) for Revenue Administration has been created as a comprehensive instrumentality to make available all the relevant information at one place and standardise the system of reporting. Of various modules, one is particularly fascinating and might be first of its kind in the whole country i.e. the module on Summary of Revenue Villages. This is one-stop gateway to all the useful information about each of the revenue villages in the state. 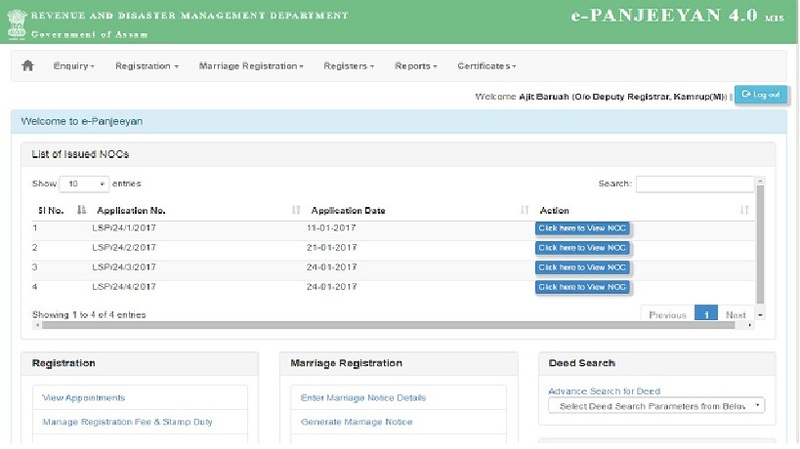 Deputy Commissioners, Subdivisional Officers, Circle Officers and Sub-registrars are required to update all the modules on regular basis and furnish online certificates by 7th of every month to the effect that necessary updation has been done. The second important instrumentality is e-Safar, the web-based system for recording and monitoring the tours and inspections by the departmental functionaries. Assam land Records manual requires the field level functionaries like, Circle Officer, Supervisory Kanungoes and Lot Mandals, to visit the villages during autumn, winter and Spring seasons to update the basic land record called Chitha and also to share with the community the status of land records. Reputed environmentalist Paul Brookes lamented that In America today you can murder land for private profit. You can leave the corpse for all to see, and nobody calls the cops. To ensure that such a situation does not arise it has been made mandatory to enter the advance village visit programmes of these functionaries on e-Safar and the system makes it possible to monitor if the visits were actually undertaken, visit reports furnished and status of action taken on those reports. State Government is aware that managing such an array of initiatives is not possible through the regular administrative set-up. It decided, therefore, to create Assam Land Management and Information Society (ALMIS) under the Societies Registration Act to support and oversee Integrated Land Records Management system(ILRMS)the implementation of all these initiatives. Located in the office of Directorate of land Records, ALMIS has pre the implementation of all these initiatives. Located in the office of Directorate of land Records, ALMIS has professionals engaged on contractual basis to do the monitoring and also to take care of the Central data Centre located therein. Besides, a new service called Assam land Revenue Service was created considering the growing need for specialization in the field of land management and it has also been decided to reorganise the existing set-up of field level functionaries in the form of Assam Subordinate Revenue Service with a view to creating better promotional avenues and utilising their empirical knowledge at higher levels of revenue administration. Department has put a lot of emphasis on the capacity-building of the revenue functionaries to equip them with the required know-how and skills to manage these changes. In addition to structured classroom based training, arrangements have been made to provide continuous onsite support through State and District Dharitry teams. To further strengthen the District Dharitry Teams Government decided to provide Consultants for Integrated Land Records Management System at the district level. Besides, a momentous decision was taken to engage Field Officer (Disaster Management) in each of 154 Revenue Circles with the specific purpose of enhancing the capacity of Circle offices for working with the VLMCCs and to prepare VLUPs and Village Master plan for conservation and Disaster Management. Field Officers are required to take the messages on ethical relationship with land and prepared of the community to cope with natural and man-made disasters. State Government has been appreciative of the fact that capacity-building is based pursued by creating an eco-system conducive for self-directed learning and meaningful communication, both vertical and horizontal. A multi-pronged strategy has been worked out to create that ecosystem. A web-based interactive Knowledge Management System is being developed for the departmental functionaries to be able to keep abreast of the progressive and innovative developments relating to their functional landscapes within or outside the country and share their own experiences and ideas. Secondly, it has been decided to utilise the NIC's SMS gateway to share educative information capsules on important areas of conservation and disaster management. Thirdly, periodic review meetings are being designed as fora for knowledge-sharing through the institutional mechanisms like District Disaster management Authority (DDMA), Circle Disaster Management and Conservation Committee (CDMCC) and Village land management and Conservation Committee (VLMCC). The process of knowledge sharing is never complete unless it provides ample scope for the sharing of the tacit knowledge of the people on the ground. Wendell Berry makes the same point when he says that as knowledge expands globally it is being lost locally. This is the paramount truth of the modern history of rural places everywhere in the world. And it is the gravest problem of land use: Modern humans typically are using places whose nature they have never known and whose history they have forgotten; thus ignorant, they almost necessarily abuse what they use. There is also a serious and well-conceived effort to strengthen the organisational for the survey and re-survey. Process of replacement of old methods of survey by introduction of modern equipments like, DGPS, ETS etc. has already been started and survey officials have been trained in the use of these equipments. It is now under active consideration of the Government to upgrade the organisation into a full-fledged Directorate of Survey and replace the existing system of periodic Survey and Resettlement Operations that take decades to be completed by the concept of continuous survey and updation of records by creating Survey Wings in Deputy Commissioner offices. Two other major challenges are preparation of Village land Use Maps using remote sensing technology and ground truthing and GIS mapping of the critical land masses such as VGRs/PGRs and wetlands. A modest beginning has been made in both the areas, but it is a mammoth task and requires sizable financial resources. Information systems Integration is a commonly used term that can mean all things to all people. In a broad sense, the meaning of integration has become synonymous with a functional goal of greater efficiency, effectiveness and competitiveness in organisations. The Integrated Land Management System (ILRMS) is one of the ambitious projects for Revenue and Disaster Management Department, Government of Assam to bring about transparency and efficiency in land administration. Accordingly, the current department-centric approach of digitization will make way for a service-centric architecture. The system will deliver the entire scope of land-related services to the end users through a single window interface. improve the services offered to G2G, G2C and G2B. The objective of the ILRMS is to increase the efficiency of the Revenue Administration through automation of workflow, backend digitization, integration of multiple applications of the department and adoption of innovative modern technology for service delivery. Single window for Revenue Department to handle land records including the maintenance and updating of attribute data of Land Records, Registration of Immovable Property, Issuance of No Objection Certificate (NOC) for transfer of immovable property and Land Revenue Collection. Single window Service Delivery System that supports delivery of services to Citizens namely, obtaining No Objection Certificate (NOC) for transfer of immovable property, Registration of Property, Land Records and Land Revenue Collection. End to End Integration of Issuance of No Objection Certificate (NOC) for transfer of immovable property, Registration of Immovable Property, Land Records maintenance systems and Land Revenue Collection System. An integrated Centralized Integrated Land Records System to get the automatic mutation following registration for all types of lands. Build robust MIS Reporting System with Business Intelligence and Analytics Capabilities. Facilitate easy maintenance and Prompt updation of land records and making land records tamper proof. Conduct necessary awareness and communication among the stakeholders enabling the acceptance of online work environment. To ensure the necessary legal and policies are updated accordingly to a smooth functioning of online system. 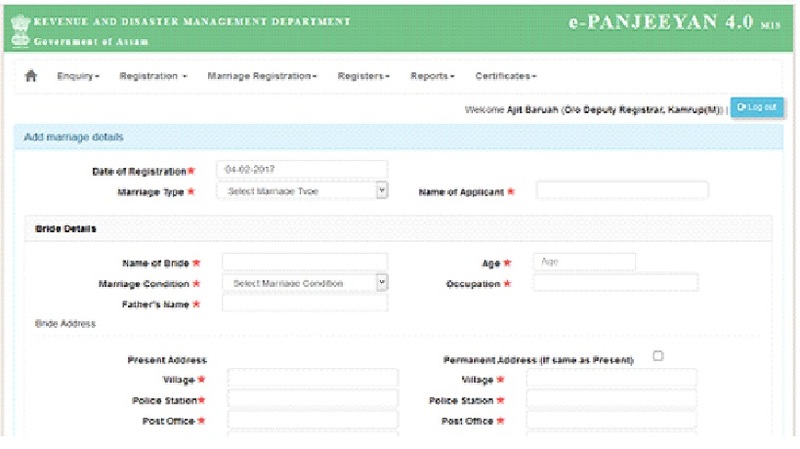 Assessment of Stamp Duty,Slot Booking for Registration, Application for Marriage Registration, Online status for Slot Booking for Registration, Deed Search,SMS. 4. Land Revenue Collection Assessment of Mouza-wise Land Revenue Collection, MIS Reports for various level of administration. Land Revenue Payment Receipt, Assessment of Land Revenue, SMS e-Payment. To transfer Land or Property one has to obtain NOC for transfer of immovable property from the authority as required under section 21 of Registration Act 1908. The procedure involved obtaining a Certificate from the Circle Officer and submits the application in the Deputy Commissioners Office and finally the Deputy Commissioner will issue the NOC. 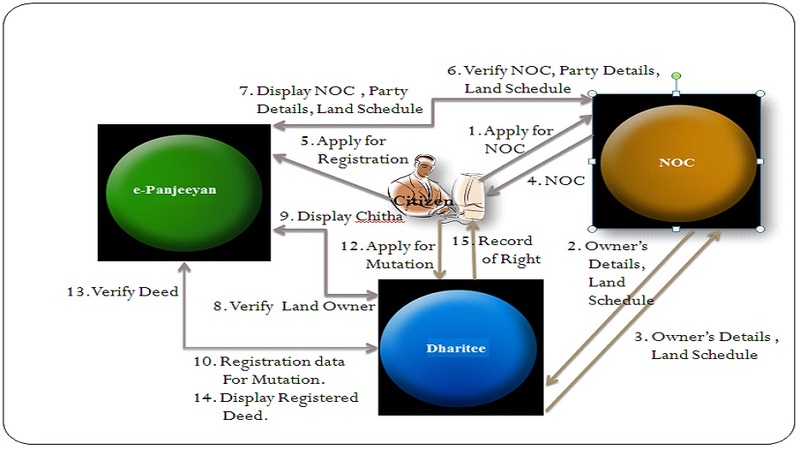 After issuing the NOC the Applicant can go for Registration and subsequently do the mutation of the Land. Apply NOC Manually after collecting the Circle Officer Certificate in the Public Facilitation Center in the DCs Office. The Branch Office/Addl. Deputy Commissioner will verify and approve and issue the NOC. The Applicant has to visit the Office several times to know the status his Application. Finally the Applicant collects the NOC from the Public Facilitation Center. Complete incomplete Application with the Temporary Application No. NOC can be applied online from anywhere. Only the person whose names are in the Chitha can apply for transfer of immovable property. Required document and photo graph can be scanned and submitted online. In the online submission of application the Applicant must fill the entire required field in the Application and must upload the entire required document. At the time of submission of the application the applicant must set a password for his application, so that the application no. and the password set by the user will be the user id and password for the applicant for the application. The applicant can see the status, reply objection and even download the NOC online using the application no. as user id and password that is set by the applicant. The submitted application is automatically forwarded to the Branch Officer. The Branch Officer will verify the application, can raise Objection and Reject the Application. On being satisfied the BO will forward the application to the concerned Circle Officer. If BO raises objection, the applicant will receive a SMS regarding the objection. On receiving the application from BO, the Circle Officer will verify it at his level. The Circle Officer can also raise objection. On being satisfied the Circle Officer will forward the application to the respective Lat Modal. The Lat Modal will login to the system and can view the complete application along with the attachment. He will submit his report online by opening the online form. On submission of LM report the application will automatically be forwarded to the Circle Officer. The Circle Officer will verify the LM report and will forward it to the Branch Officer after giving his remarks. On receiving the application from the Circle Officer the Branch Officer will verify the CO and LM report. The BO has the right to send the CO report back to Circle Officer for a fresh report. The BO will then forward the application to the Additional Deputy Commissioner for final approval and issue of NOC. The ADC will verify the Application; can see LM report, CO report and BOs decision. ADC can also raise objection on the Application. The ADC will then approve the application which he is entitled to approve and the rest application which he cannot approve, will forward to the District Level Committee or Deputy Commissioner. 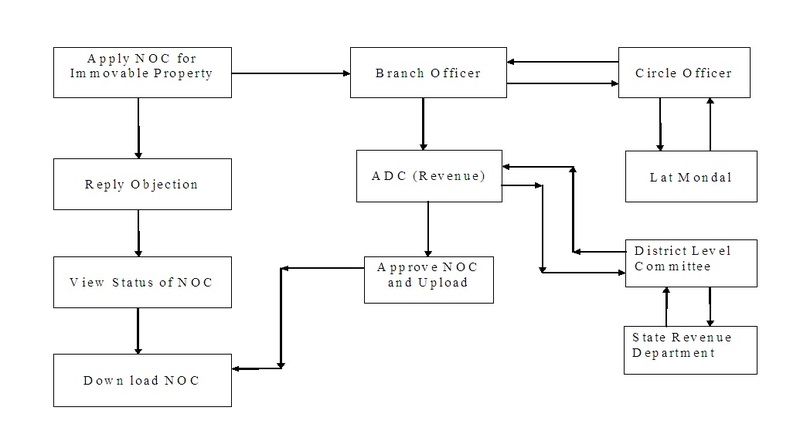 The ADC will generate the approved list of NOC and upload it to the system so that the Applicant can download the NOC for immovable property from the site from anywhere. The DC will login to the system and approve the applicant whom he can approve and the rest of the application he will forward to the State Revenue Department for further necessary action. The DC has the right to reject any application forwarded to him. The State Revenue Department will login to the system and make their decision for approval or rejection of the application. The Application approved by the State Revenue Department then goes back to Deputy Commissioner who forwards it to ADC for generating the NOC and upload in to the system. The State Revenue Department will be able to monitor the District wise status of Application received, approved and reject and also DC will be able to monitor the status of his District. The NOC for Transferable will primarily communicate with e-Panjeeyan by sharing the Land Schedule, Seller information, Buyer information, type of deed and consideration amount of the immovable property. Every possible effort has been made at the time of applying for NOC, to capture all the data required for e-Panjeeyan and Dharitree system. The Seller and Buyer information are captured in Assamese so that Assamese data can be transferred from e-Panjeeyan to Dharitree for further use in Dharitree. The Applicant can apply for NOC online. The applicants do not need to travel to the O/O of the Deputy Commissioner for submitting NOC Application. The Applicants do not need to visit the Circle Office also for collecting Circle Officer report. After submission of application the applicant will be able to see the status of his application online. Initially 1(one) month time has been fixed for issue of NOC from the date of apply. But as the system become stable the time can be reduced. The role of Lat Mondal in issuing NOC has been reduced. The role of branch assistant has been removed in the computerized system. SMS facilities has been introduced at the time of apply for NOC, if any objection have been raised by Authority and at the time of issue of NOC. The applicant can download the NOC from the site and the unsigned copy will be the final copy of NOC. It brings out complete transparency in the transfer of immovable property by providing access to the original land records. 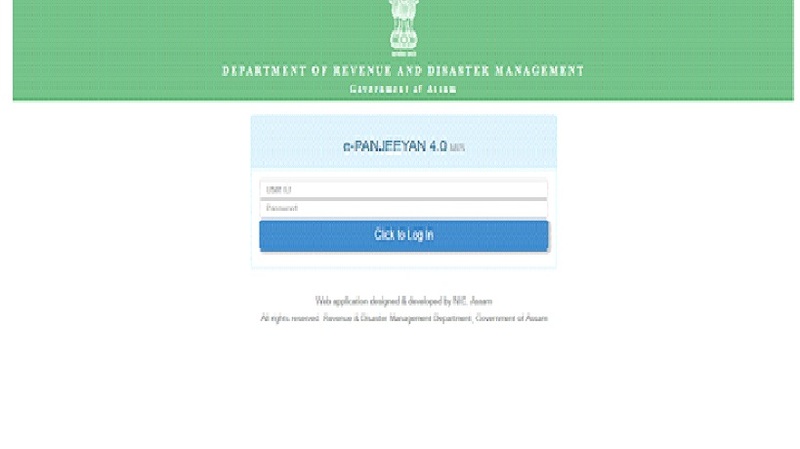 The Revenue and Disaster Management Department (R&DM), Government of Assam has initiated the state-wide rollout of Computerization of Registration. In Assam there are 75 Sub-Registrar Offices out of which 4 Sub-Registrar Offices under the Pilot Project has already been computerized under the Department of Information Technology, Government of India’s ‘Horizontal Transfer of Successful e-Governance Program’ scheme. After successful implementation of pilot project it has been rolled out in remaining Sub-Registrar Offices. 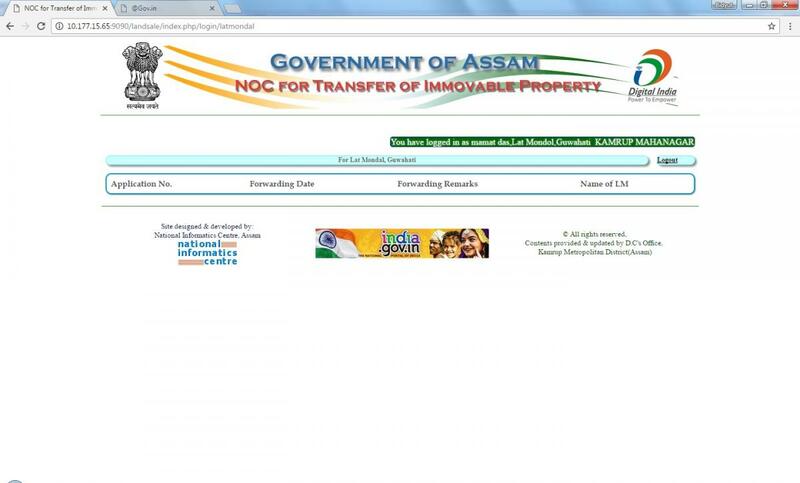 The software solution (e-Panjeeyan) for the Computerization of Registration Project has been provided by National Informatics Centre (NIC), Assam State. The software is designed as per the rules of Registration Act and built with the objective of providing operational and decision-making support to all activities of Sub-Registrar Office. The application software provides solutions for the Pre-Registration, Registration and Post-Registration activities of Sub-Registrar’s office. It also supports integration with the System of No Objection Certificate (NOC) for Transfer of Immovable Property and Land record. The client layer have web browser through which users can interact with the system. The presentation layer contains the HTML5, CSS3, Applets and JSP. The business layer contains business components, workflow components, validation & security components and the web service interface component. The data access layer contains the data access components. Computerized System to provide services to the citizen. Visible enhancement of citizen services through reduction in service delivery time. Enhance transparency and accountability in the system. To integrate with the Land Record, e-stamping, Central Server for data storage. Transparency in the registration process by automatic Stamp duty and registration Fees evaluation on the basis of the type of document and assessed market value for property. One-stop services related to registration and obtaining the original registered document in the same day (in Manual process it take 10 or more years). Simplified the registration procedures for obtaining Certified copies of Documents, Non Encumbrance Certificate, Marriage Certificate. MIS reports for monitoring Enhanced the speed, reliability and consistency of system. On-line query on registered documents and its retrieval. Digitization of photographs and finger prints to ensure genuine witnesses, executants & claimants. Assessment of Stamp Duty and Registration Fee. Slot booking for document registration. Easier tracking of all applications. Online verification of NOC for Transfer of Immovable Property and Ownership of land from Land record system. Automatic generation of all meaningful MIS reports. Assessment of fees and stamp duty based on document-type. Auto-generation of serial number of the document presented. Scanning of documents and Biometric Inputs (i.e. Digital Photo and Finger Impression of 1st Party, 2nd Part, and Witnesses). At the end of the day, generation of accounting figures viz, the total receipt of fees, its instrument-wise break up, stamp duty and additional stamp duty. Searching and Printing of a document based on certain criteria. Registration of Marriage as per Indian Marriage Act. Assessment of Stamp Duty and Registration Fee based on Document type. 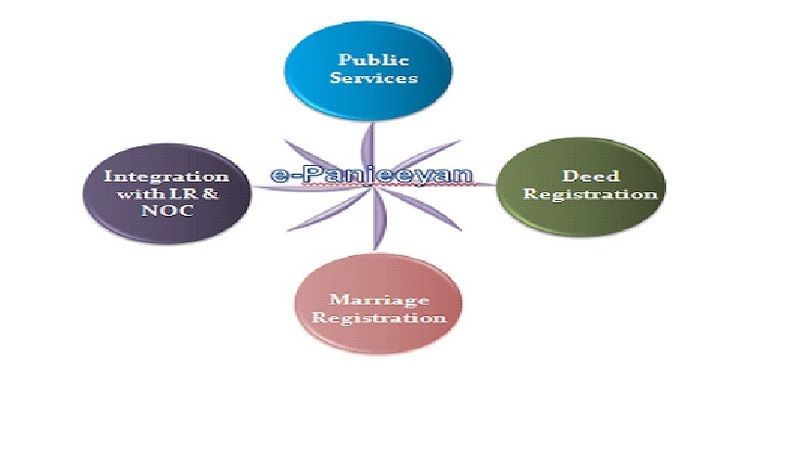 Registration of all type of documents. Issue of certified copies of documents. Issue of Marriage Certificate under Indian Marriage Act. Various reports for the Sub-registrar. 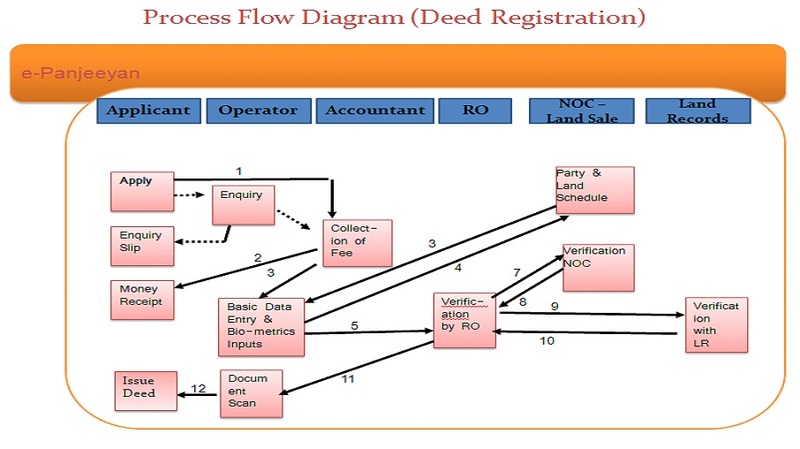 Integration with the system of NOC for Transfer of Immovable Property for Verifying the NOC and pull the details of Buyer, Seller and Land Schedule from NOC system for registration. Land Record for Verifying the ownership details of land and exchange of registration data with Land Record System for mutation. User role to the Circle Officer for online verification of the Registered Deed. The system is integrated with e-Stamping system for verifying and locking of the certificate issued by SCHIL by the Sub-Registrar after registering the document. Training on ICT and Application software is used as an effective tool of the Change Management Plan for skill building and creating an interest around the project and also for providing confidence to the employees about the change process and its benefits which ensures least resistance from employee’s with regard to changes in the processes and systems. Feedback analysis and corrective action are used to follow-up with the employees to understand how the changes are working. The feedback gathered helps in developing corrective actions and post-implementation change management activities. Make Instant Assessment of Stamp Duty and Registration Fee. Allow instant access to application and data. Improve data integrity with single entry of data. Facilitate the formulation of accurate and complete record. 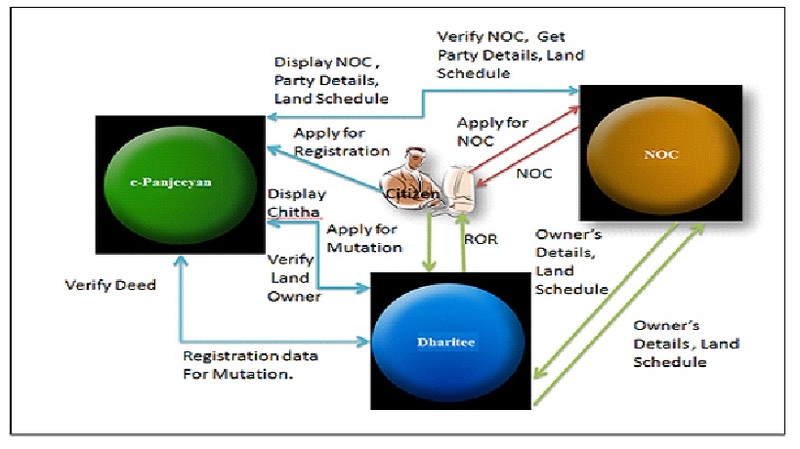 Suo-moto carrying out of Mutation (নামজাৰী) after receiving registered land deed data automatically from the Registration system. Partition of plots (বাটোৱাৰা) and simultaneous updation of Cadastral Maps. Reclassification of Land Use( শ্ৰেণী পৰিবৰ্তন). NR Case( Cancellation of Annual Patta )( একচনা পট্টা ৰদকৰণ ). Correction of Land Records against Court’s Order. Correction of Land Records against Appeal Cases. A set of MIS Reports to instantly and transparently monitor the progress of land records correction/updation by all levels of officers. A function for the Lot Mandal to update records of his field visit data (চফৰৰ তথ্য) in the Chitha ( বেফছলী, ফছলী, ফলমুলৰ গছৰ বিৱৰণ আৰু বেদখলৰ বিৱৰণ). Format for the Central Diary standardised and all the papers received in the Circle Office to be entered in the central Diary. Unique Serial Number to be generated for every paper received. Case Number for the applications received for Mutation, Partition, Conversion, reclassification etc. to be auto generated. Facility for informing the applicants of the status of their application through SMS at different stages, like, registration of the case, notice regarding date for hearing, if any additional information or paper required, and final disposal of the application. Auto updation of Zamabandi on corrections effected in Chitha. Auto updation of Chitha on the passing of order by the Deputy Commissioner in regard of Reclassification and Conversion. No partition order can be generated without effecting corresponding corrections in the map through Bhu-naksha. Instances of mismatch between the Chitha and Map can easily be ascertained by generating missing plot report for a village and map correction can be done Suo-moto. Improvement of efficiency, less paper work and timely correction/updation of land records. Hassle-free delivery of service to the citizens, governments. Citizens can access Chitha and Zamabandi online and download and print out the records. Online monitoring of land records of the State/Districts/Circle Offices by all levels of officers/officials. Integration with the online system for NOCs and e-Panjeeyan. All the NOCs travel automatically to the inbox of the Circle Officer concerned. The fact of registration of a Sale Deed or any other instrument in respect of a plot of land automatically gets entered in the Remark column of Chitha and the information also travels to the inbox of the Circle Officer concerned. Circle Officer can access any of the NOCs and Conveyance Deeds and take a print-out of it as required. Sub-registrars have access to the Chitha and Zamabandi and can verify the facts stated in the applications for registration online. Deputy Commissioners can access the land records in respect of applications for NOC online. It has become possible to access information on the lands held by one person in different parts of the district or many districts. Zama Washil, the basic record with the Mouzadars for land revenue collection, is generated through the system.